Never have I felt the need to worship God as much as tonight. The aching heart and the lies and deceit of the flesh had nawed at my soul. The worship band, the masses alongside me, and the realization of God's presence were an abundant blessing. God's hand is in every aspect of our lives. He is not silent. He knows the burdens of our heart. Shadows was a reminder to cast all our worries and fears at the cross. We then sang remembering the saints that are in heaven praising their Heavenly Father along with us. When we remember we are loved and forgiven we can weep joyful tears remembering His goodness. His love encompasses our hearts and in gratefulness we can give our lives to serving Him. We are His forever and ever. Two years ago, I woke up one morning unable to move my legs. I was concerned but I sensed that God would use this experience to change my life and other's lives for good. I was at peace. I wanted an answer for my ailment but I was content knowing that God had a plan greater than I could imagine. Shortly after I was diagnosed with Lyme Disease. I was already struggling with a nerve injury and the combination was debilitating at times. Through that rough winter and the ones preceeding it, God brought me and my family to Hawai'i. The trials that brought us here were more of a blessing than I can ever explain. The trials that are blatently in my face sometimes seem easier to get through then ones I encounter on a daily basis. I feel as though God has more of a plan in the big picture than in minute details. I neglect to remember that it is all a part of His great story. Whether it is an argument with a friend, the schedule that fails to go my way, or messing up on a project that will affect others; it is all shaping and changing me. Each converstation leads us to the next and every failure allows us to know what to change. These seemingly minute frustrations change us just as much as the seemingly more difficult ones. My tendency is to hang onto the little frustrations. If one small detail or conversation goes wrong I allow it to ruin my day. I have a list in my head of everything that went wrong and I carry it with me allowing it to consume my thoughts and actions. I have tried to control my own happiness instead of looking to Christ. I have cared more about what others think of me than my Heavenly Father. I need to daily confess and change. My desire in writing this blog is to find joy in each day. To break free from the chains of darkness holding me back and run steadfastly into the Light. In seventy days, the last job I need is one as a Latin Teacher. It is not the course material that I am afraid of teaching. In fact, I have always had teaching latin to grammar students in the back of my mind. My objection is with my soon to be last name, Ah Mow. 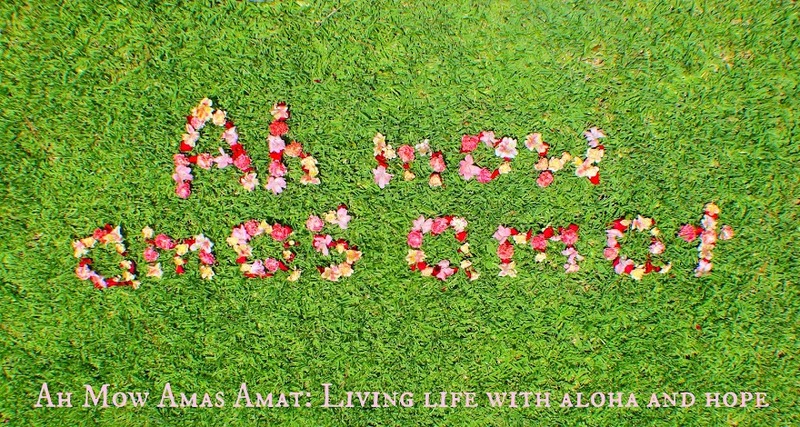 In third grade the first chant I learned was "amo, amas, amat, amamus, amatus, amant" meaning "I love, you love, he/she/it loves, we love, you all love, they love". Sometimes this chant was said while doing the Mexican hat dance and others times we were as monotone as could be. The chant brings back good memories of grammar school. But I also remember a few years prior reciting phonics as a class. As soon as we said 'oo' as in crook we all pointed and glared at our teacher Miss Crook. Do you see where I am going with this? As Mrs. Ah Mow, I am destined for giggles ensuing if I ever instructed children in the amo chant. My family began the amo chant teasing a long time ago. It is funny I must admit. After mulling over the perfect blog title for a week and arriving at no conclusion, I went to Super Woman more commonly known as my mom. Without even thinking she blurted out the title "Ah Mow, Amas, Amat". A wave of emotions swept over me: laughter, amazement, and quite possibly a hint of frustration at her wittiness and prompt answer. The name is perfect and it is here to stay.